Hmm, I’m a bit mixed on Broken Trinity: Pandora’s Box #3. Top Cow has shown in other series how you can have a great mix of action, character development and amazing art all in one package. In this comic we get the action and the art, but the character development seems to be missing. It’s not that I disliked this issue, it’s a big summer blockbuster. The problem is, I’ve seen what they do in other series, and that great character aspect is missing here. The ARTIFACTS lead-in heats up! Elias and the Disciples of Eden are drawing closer and closer to Pandora’s Box, one of the 13 Artifacts, threatening to remake the world in their mad vision. Meanwhile Finn and Glori, the bearers of the Glacier and Ember Stones, race around the globe to beat the Disciples and each other to the same goal. From newcomers Rob Levin (The Darkness: Shadows & Flame) and Bryan Edward Hill (Broken Trinity: Aftermath), and artist Alessandro Vitti (Secret Warriors). Featuring covers by Tommy Lee Edwards (1985, Turf)! The comic is entertaining. This is a Michael Bay movie in comic form, and some times that’s ok. But with it tied in so well with Artifacts, it feels like I need a bit more. That latter series very much has that great mix that this issue seems to have missed. 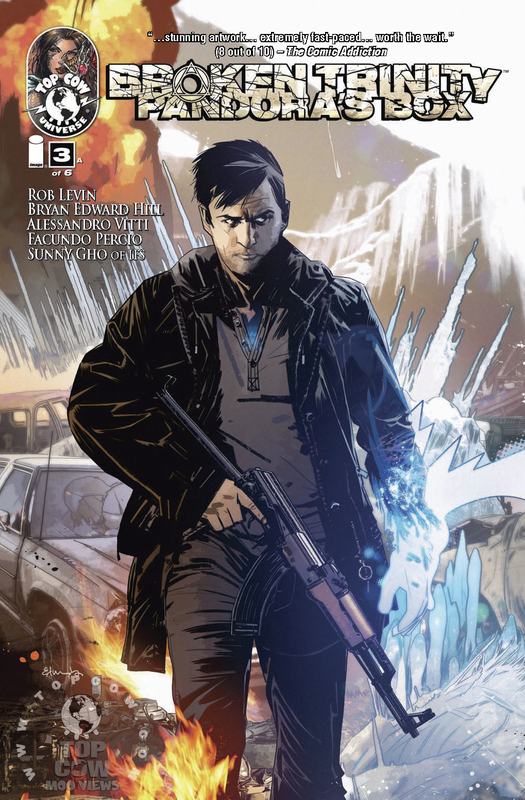 Top Cow provided Graphic Policy with an advance copy of this issue for FREE for review.